The Board of Appeals this week approved a proposed Newbury Street sandwich shop in which customers grab a bag, write their sandwich options and their name on it, then hand that off to a counter person for sandwich assembly. Read more. Boston Restaurant Talk reports that both Tremont 647 and Sister Sorel on Tremont Street are closing April 1. The Boston Licensing Board yesterday approved a food-serving license for Joseph Adamo's 320 Cafe at 320 Spring St. in West Roxbury. Read more. Joseph Adamo, a chef with more than 20 years experience at restaurants in Europe and the US, is looking to turn the old Spring Street Cafe on Spring Street at VFW Parkway into a new place called 320 Cafe, possibly in time for a fall opening. Read more. Boston Restaurant Talk reports the impending opening of Milkweed, a cafe on Tremont Street at Burney Street, and that one of its menu items might be pancakes made with Lucky Charms. The branding work that went into the cafe. Boston Magazine, whose writers can see the place from their office windows, reports that restaurant operator Douglas Bacon is getting closer to re-opening the long closed Symphony 8 on Westland Avenue under a new name: The Westland. Read more. Larry Davidson likes the Industry, a new higher-end restaurant at 750 Adams St. with features more typically found downtown or along the waterfront, such as valet parking and a "nitrogen fueled draft beer system" - although he says he's going to keep the Ashmont Grill as his primary go-to Dot restaurant. Well, there was one small problem with the menu. Usually when I go to a new restaurant I find two or three entrees I really want to order, which makes it a relatively easy choice. But at The Industry I wanted to order everything on the list of entrees! The Boston Licensing Board votes tomorrow whether to let George Vinal and Angelo Stamos buy the Crossroads Irish Pub, 495 Beacon St. and turn it into a "neighborhood dining concept" called St. Locale. Read more. People of Boston please help me. Where can you get a great grilled cheese with bacon? Douglass talks up Third Rail plans. See it larger. The Boston Licensing Board could decide in a couple weeks whether Chris Douglass gets a liquor license for the Third Rail restaurant he's planning for the old trolley substation at Washington Street and Cummins Highway. Read more. 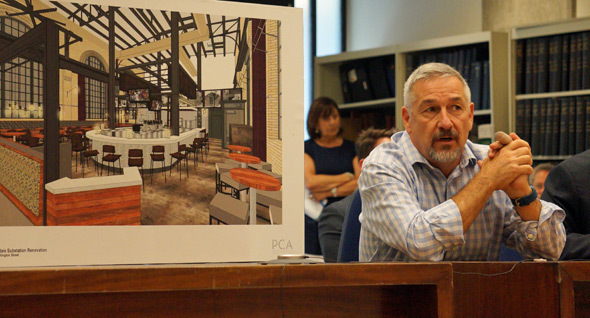 The Boston Licensing Board decides tomorrow whether to let chef Douglass Williams buy the beer and wine license from the defunct CluckIt so he can open a neighborhood place serving "Italian influenced, American executed" food. Read more. Is Sullivan's like a polling place? If you're in line at the official closing time, will they still let you in? Robert Alvarez shows us the line five minutes before closing today at Sullivan's at Castle Island, which was doing land-office business all day. H/t Joan Marshall for posing the question. Boston Restaurant Talk reports the Briar Rose on Hyde Park Avenue has wilted. It's the latest restaurant to close (or to never even open) at that spot. It was also Kevin Twohig's second go at a restaurant on Hyde Park Avenue, after Maggie Mae's up at Canterbury Street in Roslindale (where Delicias Dominicanas is now). Douglas Bacon, who owns several restaurant/bars in the Allston area, said today he's completely recasting two and seeking a bit of an hours change at the third. Read more.